The rainy season is getting nearer and with it is the season of mosquitoes and flies. Because of this, the threat of illness due to these bugs are on the rise and parents will once again be more concerned about the protection of their children against the diseases like malaria, dengue, dysentery, and cholera. One way to protect yourself and your family is by killing these pests using flyswatters and flypaper. However, there is a better way of killing these bugs and that is by using the Electric Bug Zapper. The Electric Bug Zapper is a simple tool that uses electricity to kill insects. It is shaped like a tennis racket with the head acting like an electric fence. 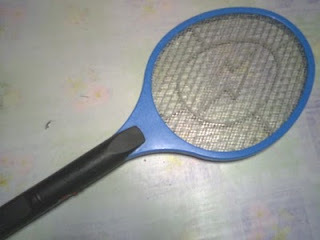 Any bug that will be hit by the racket will be zapped and burst. If fully charged, this gadget is strong enough to kill a fully grown house lizard but weak enough not to electrocute a person. Anyone touching the racket head will be zapped but the electricity is not too strong. This device is ideal to use when insects tend to swarm in one place, which is usually the habit of mosquitoes. The broad face also increases the chance to hit the target insect, as compared to the normal fly swatter. You also spared of the messy way of dealing with insects, as compared to the fly swatter because the insect tend to burn, which means that they do not leave any entrails. The Electric Bug Zapper could be bought at any public markets, just look for shops or kiosks that sells products for 100 pesos and below and you will find this gadget. I had bought mine at the Commonwealth Market. I heard that some malls, specifically the Ever Gotesco and Robinson Malls, have this product. The price of the Electric Bug Zapper is around 100 pesos (about 2 dollars). Be reminded though that vendors tend to overprice their products and they sell this gadget for 120 pesos. Just try to haggle with them so as to lower your price. Prices at the malls is higher than those at the public markets. Electric Bug Zapper is not a toy and it uses electricity so keep it away from children. Touching the racket head causes an electric shock that may surprise the kids more than adults. This gadget is directly plugged in the wall sockets to be charged. Just be sure to unplug this device before you sleep. Overcharging may cause the rechargeable batteries inside to explode. Read about ways to keep your family safe from mosquitoes. Read my tips on how to keep your home dengue free. Also, read about Imarflex Electric Mosquito Killer. Visit me in Before the Eastern Sunset and know where to sleep in Mactan. Hearing those pest pop is cool. Minsan nga pag nag-ipon na yang mga lamok sa isang lugar ay dinadale ko sila nito. Ang dami kong napapatay.